Last week, we asked you about one of the age old debates of gaming: what do you play on? 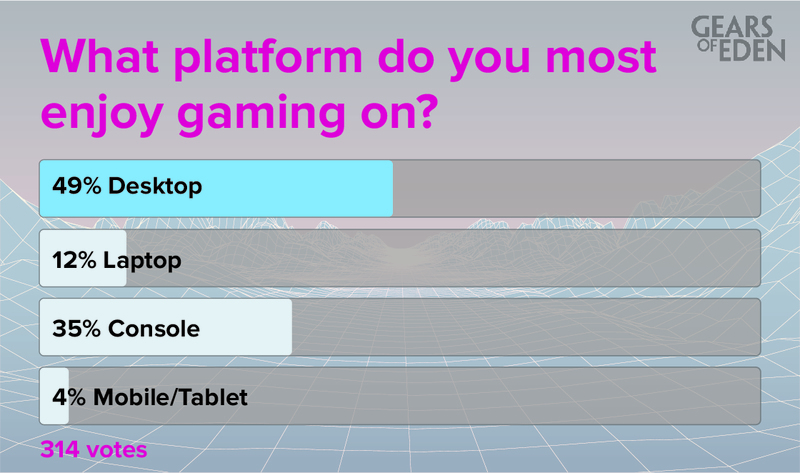 We had four options in this poll: Desktop, Laptop, Console, or Mobile/Tablet. Now personally, I mix a bit of playtime into all of these (Unfortunately, the Persona and Monster Hunter franchises have yet to come to PC), but I checked Desktop because that’s where I do most of my gaming with friends, including members of the Gears of Eden team! After 314 votes, (which blew our minds, by the way) it looks like a lot of you are in the same boat as I am! Following closest behind desktop are the console players, which is very important for us to know. See, we’re using Unity because of how PC/Mac friendly it is. Ideally, our game can reach as many people as possible, right? Well that includes console gamers, so moving forward, we’re going to look at what we can do to make the game accessible to you as well. Of course, this is an indie project and we don’t want to promise anything that we don’t know 100% that we can deliver on, but we want you to know that all gamers are on our minds. Mobile/Tablet is rounding out the bottom of the poll, as expected. We don’t plan to extend Gears to the mobile market as a full game, so that is good. However, we are considering a companion app that would let you manage things like crafting and exploration while you are away from your desktop. This week’s poll is on crafting time sinks. Internally, we’re discussing the direction we should go with the time crafting takes, but we’re a bit close to the project, aren’t we? It just might help to ask someone more casually invested in the success of our project … and that means you! Thank you so much for your continued support, we’ll be back on Wednesday with our weekly Dev Update. For those of you who feel driven to go above and beyond, I thought I’d point you in the direction of our donations page to help keep this project moving! Of course, we understand that it’s the holiday season and what that does to your wallet, so no pressure! The support you’ve shown just by reading this article or following us on social media already means so much to us here at Gears of Eden. Thank you again and have a wonderful rest of your day.